The first time I went to Fadó's, it was back when I was in college (cough) 10 years ago. My mom, who loved her Irish heritage, would love to go sit on the patio and drink Irish Coffees. Back then, they had an Irish band that would play a few nights a week. So while you had your whiskey coffee, you could hear lightly wafting Irish music, and really feel like you'd been transported to Ireland. In the last 5 years, though, I feel like Fadó's has somewhat settled for a different crowd. Gone is the Irish music, the quint feel of an Irish pub, and the over educated 50-somethings discussing politics over a pint of Guinness. Instead its now filled with rock bands and booze guzzling 20-somethings trying to hook up with one another. I think Fadó's even stopped serving food for a while back in the mid-aughts. I've been hearing recently, how they've been trying to shed their binge drinking image and embrace their Irish heritage again. 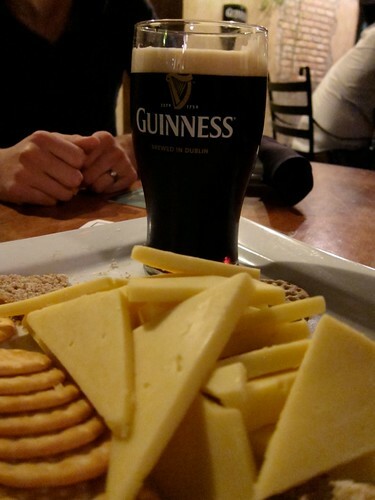 So when I was invited to attend an Irish trivia night there, I thought, why not. I'll drink some beer and maybe find someone to hook up with. I originally had the intention of drinking my dinner by way of 4 or 5 pints of Guinness, but my friends were quick to point out that Fadó's actually has some decent bar food now. And it's even Irish inspired. Who knew? 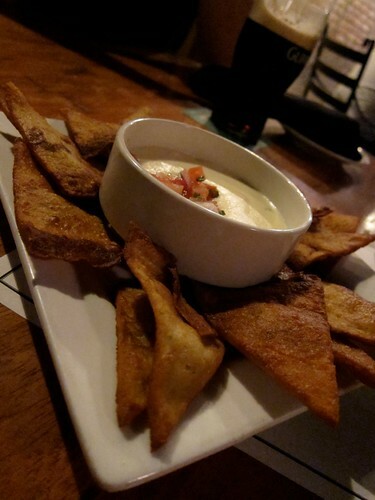 During our first round of trivia, we nibbled on Cheese Dip and boxty wedges. For those of you not familiar with Irish cuisine (I'm assuming most of you), boxty is a traditional Irish bread. A sort of cross between a potato pancake and potato bread depending on who's making it. The boxty wedges here, at Fado's, were like thin, crisp, deep-fried potato pancakes. The cheese dip is, I'm guessing, an Irish take on queso. It was a thick, peppered cheddar more resembling a fondue than queso. It was pretty delicious, though, as far as bar foods go. When we were finished with one, we ordered a second. 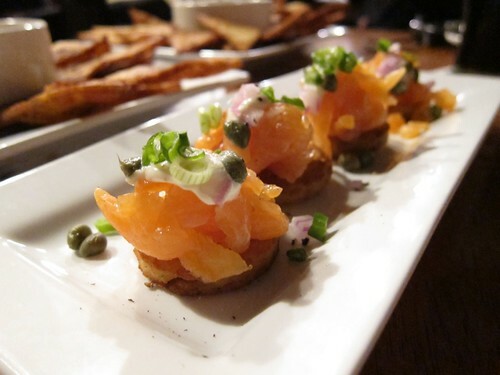 During the second round of trivia, we moved onto the Smoked Salmon bites. These seemed pretty pedestrian, at first, but the substitution of boxty instead of bread for the crustini made for a nice change of pace. 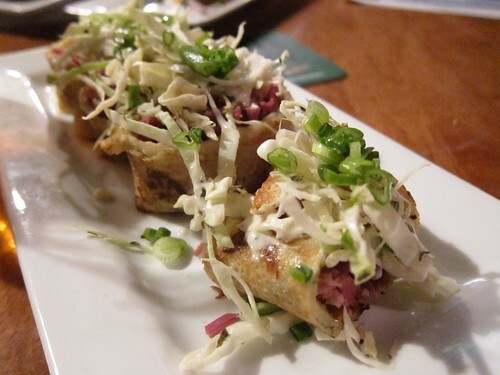 Turning sandwiches into egg rolls seems to be a popular bar food trend right now (go to Manny's for the Reuben Egg Rolls if you haven't yet, YUM). These corned beef rolls were drizzled with a creamy mustard and topped with a crisp cabbage slaw. It was pretty tasty (if not a little greasy), but really, when isn't deep fried meat delicious? 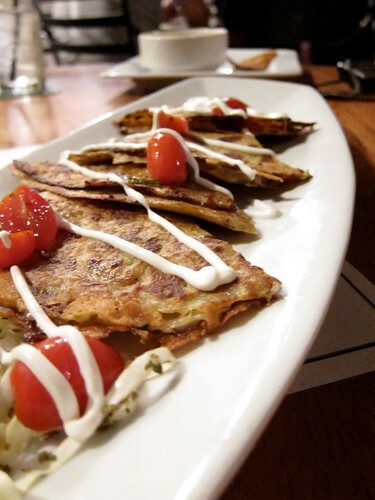 Finally, we tried the Chicken Boxty Quesadillas. Chicken and cheese between two crisp sheets of the potato boxty. It was basically a potato pancake with cheese and chicken. When they first came out, they were crisp, but like any fried potato product, the potatoes got limp over time. The oil just became a little too overwhelming. There you have it, Irish inspired bar food. All in all it was pretty tasty. They also have a 3 items for $10 happy hour (plus a beer), so I will definitely be coming back again. And be sure to try their Irish Coffee. Its still the same no matter if your drinking with your 60 year old mom or a 21 year old co-ed.